For volunteers who are on a gap-year looking to get into a related university course, or those looking for employment in a particular sector following graduation or on a career-break, our voluntary journalism internships in Ethiopia will give access to invaluable work experience and increase your prospects within a highly competitive job market. Your CV will be greatly enhanced by the practical skills that you gain during your journalism work placement as well as proving your adaptability and resourcefulness by working in a strikingly different environment such as Ethiopia. Volunteering abroad on a journalism placement with Projects Abroad offers an excellent way to gain journalism work experience, combined with the chance to work within a fascinating new culture and to experience life first hand as a volunteer in Ethiopia. 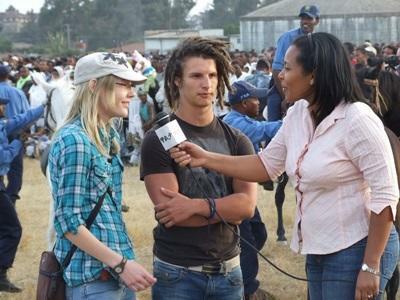 Our Journalism project in Ethiopia offer volunteers the chance to work for the weekly publication The Reporter. All Journalism volunteers must have good computer skills, a strong interest in journalism and the media and be willing to work hard. While no formal qualifications are required to join this project, previous journalism experience is preferred. When you apply, please give us as much information as possible about any relevant experience or skills you have. Volunteers will have the opportunity to write and publish many articles. These articles may be restaurant reviews, events coverage, international news, a foreigner's view of Ethiopia, or general lifestyle pieces about a topic assigned to you by the editor, or of your own choice. You may be taught how to go out and find stories on the streets of Addis, giving you the confidence and skills to do the same at home after your return. Volunteers will also play a key role in proof-reading and editing work from other writers before it is printed. If you have an interest in sales and marketing, there may also be opportunities to work within the advertising department of the paper; helping to design or write adverts and selling advertising space to external companies wishing to gain some exposure. For your colleagues, working alongside an English language speaker will be highly valued, as it will enable them to advance their own language skills, not to mention satisfy their general fascination with other cultures. Work colleagues will have good levels of English but will always be keen to learn more! During the placement, volunteers are expected to be punctual and professional and are required to work an average of 30 hours per week - usually Monday to Friday. Volunteers are given a supervisor at The Reporter, whose role it is to allocate you stories and ensure that you are happy with your work. You will also spend time at the Horn of Africa Press Institute, used as a research centre by The Reporter’s staff. All stories need to be submitted by Thursday or Friday afternoon, when the exciting dash to complete the final edition begins. During this time, volunteers will be expected to work alongside their co-workers, in order to finalise all content, layout, and printing, giving you valuable insight into of all aspects of this fast-paced and complex task. Whatever your level of experience, your input will be greatly encouraged and appreciated. Take the opportunity to make your own recommendations, or explain practices back home. Your adaptability and willingness to learn will be appreciated by your colleagues, and you will really begin to feel like a part of the team.